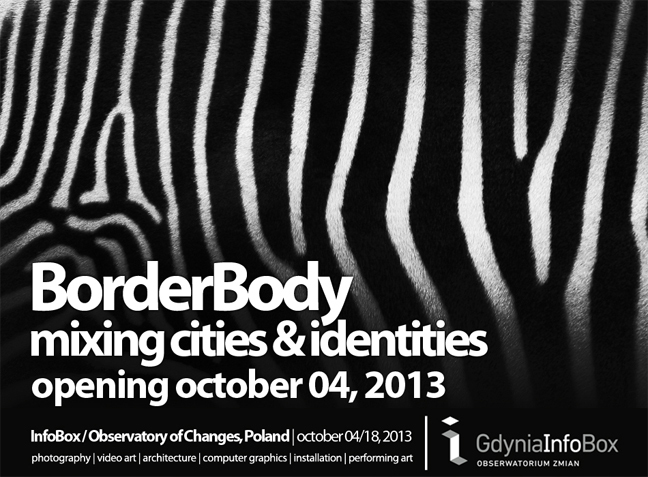 “BorderBody” festival is composed by two sections: “Mixing Cities”, which deals with modern urban changes and their influence on citizens, and “Mixing Identities” focused on the hybridization of social identities in contemporary time. The selection was based on the main concept of fluidity, motion, changing networks and cities transformations. In contemporary society boundaries are getting more and more fleeting, and also the identity; what makes every person or place a recognizable entity, turns out fluid, multiple, making the cultural, religious, ethnic borders changeable too. This change, this mutation has allowed to cross the inside of the identities creating new possible crossings, new blends. And it’s just this “contemporaneity” that makes our civilization conceived as subjected to a process of continuous evolution and cultural hybridization. There is no more limit between an identity and the other one but it is possible to walk, to cross a passage and to find oneself halfway through it, in a non-place, in a non-identity. People, backgrounds, societies, progress and all their inputs creates hybrid identities, modifying each other and being mixed in prospect to shape a better world. Mixing sustainable transport; modern (ICT) communication infrastructure; sustainable economic development; and wise management of natural resources, human, intellectual and social capital, is the key to reach a future better life quality. Changes are always positive and they represent our future.